The San Jose Sharks were movers and shakers this offseason as is the custom of general manager Dealin’ Doug Wilson. Wilson sent a wave through his prospect pool with a pair of deals that sent two first round picks packing and had a solid 2017 Entry Draft even if the front office seemed to go about it a bit backward. 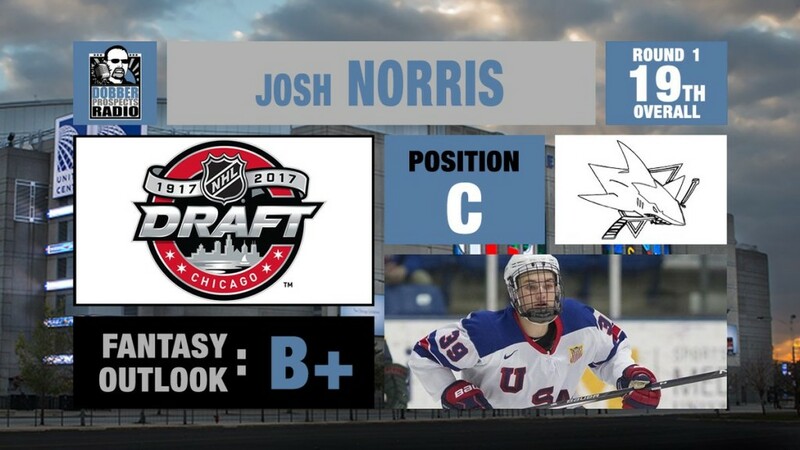 It might have been a bit early to take Norris, but the NHL certainty of the NTDP center must have been hard to resist. The Sharks left a lot of skill on the board as they passed on Kailer Yamamoto, Robert Thomas, Klim Kostin and Kristian Vesalainen (among others) on the board to take the 6’0 center. Another reach for the Sharks as Ferraro was a player identified as a possible rounds five, six or seven targets for the club. Ferraro was a teammate with Adam Parsells (2016 Sharks draft pick that was not qualified) with the Des Moines Buccaneers of the USHL, so the scouts certainly had plenty of looks at him. He’s a skilled, swift defender that gets the puck up ice in a hurry. He isn’t a big body and still needs to add a good deal of muscle and power to his shot and stand up to the professional game. I actually had Reedy ahead of Norris and getting him in the fourth round is fantastic, bordering on insane, value. Reedy has more creativity with the puck, and the Sharks’ overall prospect pool has plenty of bottom, and middle six forwards and swings for the fence on offensive products is needed. Reedy is a step in the right direction here with a big frame and skilled playmaker. Who? No one knows because McGrew sat out all of the 2016-17 season with the Spokane Chiefs with a terrible knee injury. McGrew is regarded as a goalscorer and last played for the Jr. Kings in Southern California where he potted 29 goals and 18 assists in just 32 games. It’ll be interesting to see how he bounces back next year with the Chiefs. This pick reminds one of Kevin Labanc. Chemelevski was much high on many lists and slid further down than expect with concerns about consistency and skating. Expectations were massive for Sasha as he was part of the return from Sarnia for Travis Konecny and his season certainly was not what anyone was expecting. As he matures, he should be able to put it together mentally and let the skills take over. Again a huge value to infuse skill in a player many considered a top 100 pick at the start of the year. The third overall pick in the CHL's 2016 Import draft, fell to the last half-dozen players in the draft. The Russian forward put up 59 points for Baie-Comeau Drakkar in 60 games and can be a difference maker in games. His compete-level is modest, but once he has the puck, he is dangerous wherever he is on the ice. Another player that if he puts it together could be a steal. Good bye Goldy and Mirco, Hello Europe! San Jose moved their 2013, and 2014 first round picks in 110 days as they shipped Nikolay Goldobin to the Vancouver Canucks for third-liner Jannik Hansen in February. Then with the expansion draft bearing down on them, sent Mirco Mueller to the New Jersey Devils for a pair of picks when it wasn’t clear if he was the best defender of his pairing in the AHL. It was another couple of apparent misses in the first round with only Logan Couture and Tomas Hertl (and perhaps Timo Meier in time) that are making an impact for the Sharks during the Wilson era. One area where Wilson seems to be ahead of counterparts is plucking skill from Europe. Winger Marcus Sorensen and right-handed defender Tim Heed were both taken from the SHL last season and were significant parts of the San Jose Barracuda’s run to the AHL Western Conference Final. The Sharks reached back into the Euro Zone as they signed Radim Simek from the Czech Republic and Filip Sandberg from SHL champions HV71. A pair of undrafted free agents born in Europe but lately skating in North America join the organization as well in Czech netminder Josef Korenar and Danish center Alexander True. Korenar’s signing addressed an organization hole with no notable goaltending prospects under 23 anywhere in the prospect depth chart. Korenar was the most impressive of the goalies at Development camp as evidenced by his three-year entry-level deal he signed soon after. True is a big body on a two-year AHL deal with the Barracuda, but his size will matter a lot to the generally smaller frames with ‘Cuda. The Sharks also signed Latvian winger Rudolfs Balcers soon after the conclusion of development camp. The shifty winger with a deadly shot recorded 40 goals for the Kamloops Blazers last season and showed steady progression all year long. With Sorensen and Timo Meier likely up with the Sharks next year and Kevin Labanc in the mix as well, Blacers could be a driving force for the Barracuda offense. Speaking of Kevin Labanc, the former OHL scoring champion had a rough second half last year. He was sent down to the Barracuda late in the year for the AHL playoffs and never really got going after being Goldobin’s triggerman in the AHL last October. It will be interesting to see where Labanc is at. During the development camp scrimmage, it was noted he was trying to be too cute with the puck as opposed to showing what he can do with his linemates. And let’s not forget Sean Dhooghe who stole the show at the Sharks’ development camp. The 5’3, 140-pound winger had a slow start with the NTDP but by the end of the year was Team USA’s leading scorer at the U18s. He joined a few of his teammates from The Program but the diminutive forward was quickly a fan favorite with the crowd chanting for Dhooghe in the shootout, and he did not disappoint. Dhooghe will head to the University of Wisconson this fall and play for former San Jose Shark Tony Granato. There is not the elusive, elite speed in Dhooghe that you want to see in smaller players, and at 5’3 he’d need to have McDavid-esque wheels, but a smart hockey player can go far, but it will remain to see just how far. The Sharks will likely have a handful of fresh faces on the roster next season that are familiar but finally getting a look at a full-time job. Timo Meier is an NHL player now, the departure of Patrick Marleau has etched that in stone. No other prospect has his pedigree, and he’ll have to prove he can’t play before the Sharks move on from him. Chris Tierney’s resigning also makes it a bit fuzzier but Ryan Carpenter (plays all three forward positions, kills penalties and plays well in all three zones) and Marcus Sorensen (fastest player in the organization with the departure of Patrick Marleau) are favorites to emerge from the pack. Kevin Labanc will need to show he has made strides since last season to step over any of those three players and Danny O’Regan is likely spending another season on the farm. On the blueline, the Sharks lost David Schlemko to the expansion draft where Vegas quickly cashed out a fifth round pick for the veteran. The opening is likely filled by Dylan DeMelo, who stylistically is the right-handed version of David Schlemko and a keen match as a comparable. Tim Heed and Joakim Ryan were key cogs to the Barracuda’s success last season and dominated for long stretches of the season with gaudy point totals and quickly transitioning the puck up ice. Also, don’t count out Simek as a player that could join the fight for the seventh defender spot as Julius Bergman and Nick DeSimone are another season of seasoning away. – Jeremy Roy skated after another injury cost him much of the 2016-17 season. The knee surgery was successful, but he looked like he lost a step and his fitness was not where we saw it last year. – Nick DeSimone had a pair of goals in the development camp scrimmage and looked like he gained a measure of confidence over the summer with the puck on his stick. Another skilled right-handed defenseman for the Sharks who seem to be able to find one every season. – Danny O’Regan did not participate in the scrimmage as he continues to recover from an elbow injury sustained against the Grand Rapid Griffins in last year’s AHL Western Conference Final. – Barclay Goodrow is the only remaining restricted free agent the Sharks have yet to sign. However, he has been passed over on the depth chart and might need a change of scenery to regain relevance at the NHL level outside of an emergency call-up. – Rourke Chartier’s knee injury is healing well, and he should be back for rookie camp. The Barracuda missed the two-way center in the playoffs and expect a big year from him in his second year as a pro. – I’m not sure if Sean Dhooghe can play in the NHL, but much of San Jose (and your humble writer) are rooting for him.